Former Jets/Saints linebacker Jonathan Vilma has announced his retirement from the NFL, according to a statement issued by the Saints. Vilma, 33, is set to be honored later today before New Orleans’ game against Carolina. Vilma, a first-round draft pick in 2004, played four seasons with New York before heading to the Saints in a 2008 trade. The former Miami Hurricane would spend the next six seasons in New Orleans, starting starting 68 games during that time. Injuries sapped Vilma’s ability during the 2013 season, and though he drew free agent interest during the summer of 2014, he never latched on with another club. The three-time Pro Bowler finishes his career with more than 600 tackles, 10.5 sacks, and 12 interceptions. As Lindsay H. Jones of USA Today noted last month, the 2014 offseason has not been kind to linebackers. Sean Lee, Kiko Alonso, Sean Weatherspoon, Daryl Washington, and Robert Mathis are among the LBs who have been lost to either injury or suspension. While allowing that linebacker is one of football’s most fungible positions (excluding 3-4 outside pass-rushers), teams still need to deploy competent defensive players in the middle of the field. As training camp gets underway, more LBs will inevitably suffer injuries, forcing teams to inquire on available free agents. Among defensive players, veteran inside ‘backer Jonathan Vilma is perhaps the most intriguing name who is still out of a job. Vilma, 32, entered the league with the Jets in 2004 as the 12th overall pick out of Miami. After four largely successful seasons in New York, during which he was selected Defensive Rookie of the Year and was named to the Pro Bowl, he was traded to the Saints. During seven years with New Orleans, Vilma was again named a Pro Bowler (twice) and won a Super Bowl. He was, however, engaged in the Saints’ “bounty scandal”; after a suspension, appeals, and courtroom action, Vilma was somewhat exonerated, but only played in 11 games in 2012. He underwent a knee scope before the 2013 season, and ultimately made it on the field for just 12 defensive snaps. Vilma was not re-signed by New Orleans in March 2014. Besides Vilma’s play, the obvious concern for teams would be his health. He was originally placed on the injured reserve/designated for return list following his knee injury last summer. When he returned midseason, he barely lasted a series’ worth of snaps before being placed back on I.R. The immediacy with which the Saints’ medical staff determined Vilma was unfit to play is certainly concerning, especially for a 32-year-old. However, Ian Rapoport of NFL.com reported on June 18 that Vilma’s knee received a “thumbs-up” medically, so perhaps his injury concerns are lessened for the time being. Many teams could use help at linebacker, but it’s always important to consider scheme fit when discussing LBs. When Vilma was traded by the Jets, the prevailing opinion around the league was that he was a poor match for Eric Mangini’s 3-4 look. The Saints mixed in some 3-4 fronts while Gregg Williams was the defensive coordinator, and Vilma did struggle — during Williams’ final two seasons in New Orleans, Vilma ranked as the worst and third-worst LB in the league, per Pro Football Focus (subscription required). At 230 pounds, Vilma is generally considered too small to flourish as a 3-4 “Mike” linebacker. However, when the Saints brought in Rob Ryan and his 3-4 defense in 2013, there was some optimism that Vilma could fit as the weakside linebacker. Additionally, 3-4 LBs aren’t expected to cover nearly that ground that 4-3 ‘backers do, so perhaps a 3-4 look could benefit an aging Vilma. All of which is to note that Vilma doesn’t lack for options when searching for a potential match with a team. PFR’s pages show that Vilma has been linked to teams such as the Falcons and the Cowboys (each of whom lost a key linebacker), while Vilma himself reached out to the Dolphins, who were not interested in his services. I think the Cardinals would make some sense, as they are relying on an inexperienced Kevin Minter and an older Larry Foote in the wake of Washington’s suspension. The Broncos and Giants are also asking marginal players to contribute in the middle, and could be viable landing spots. The Vikings could be interested, as well, but Vilma might not want to play for a team that probably won’t contend in 2014. At this point in his career, Vilma won’t be handed anything but a one-year deal. A contract for the minimum salary benefit, with a modest signing bonus, is a real possibility, especially considering his injury history. A team could potentially get desperate later in training camp, and offer Vilma a slightly larger deal, perhaps laden with performance-based incentives and/or gameday active roster bonuses. Ultimately, he’ll have to decide how badly he wants to return to the league, and if he lands with the right team and the right defensive front, he could end up being something of a bargain. 8:30pm: The injured knee that landed Vilma on the injured reserve has received a “thumbs up” medically, tweets Ian Rapoport of NFL.com. He adds that if Vilma’s signed, it will be before training camp. 4:19pm: Things could change, but as of right now, the Falcons won’t be signing free agent linebacker Jonathan Vilma, according to Mike Garafolo of FOX Sports (on Twitter). Atlanta worked out Vilma earlier today. If the Falcons sign Vilma, Garafolo says that it will be further down the line and possibly during training camp. Vilma and other veteran linebackers have been connected to Atlanta ever since the team lost Sean Weatherspoon to a ruptured Achilles, but the Falcons might not be in a rush to find an out-of-house replacement, if at all. It’s also possible that Vilma’s performance today wasn’t quite what Atlanta was expecting. The former Jets and Saints standout has struggled with a left knee problem that limited him to just one game in 2013. Falcons coach Mike Smith says the club is going to look in-house to replace the injured Sean Weatherspoon, but that doesn’t mean that they won’t evaluate their options in free agency. Ian Rapoport of NFL Network (on Twitter) hears that the Falcons are looking hard at former Saints linebacker Jonathan Vilma. They’re also keeping an eye on fellow free agent veterans Pat Angerer and Tim Dobbins, according to Rapoport’s source. If Vilma’s medicals look good, the Falcons may bring him in for a visit soon (link). The addition of Vilma could help shore up Atlanta’s linebacking core while also giving them some needed leadership in the locker room. 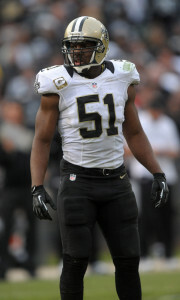 Vilma is also being considered by the Cowboys, along with Brian Urlacher, as a potential replacement for Sean Lee. The former University of Miami star played only 12 snaps in 2013 following a knee injury. Back in April it was reported that Angerer had interest from multiple clubs but wanted to make sure he was back to 100% health before auditioning for anyone. Angerer, 27, recorded 126 tackles in his first two NFL seasons but has played in just 12 games over the last two. Dobbins, 31, saw just three games of action last season for the Texans. While Vilma, Angerer, and Dobbins will be considered by Atlanta, Rapoport says (link) that ex-Steelers LB James Harrison and the recently retired London Fletcher won’t be looked at. Earlier today, our own Luke Adams gave a thorough breakdown of all of the Falcons’ options and mentioned Vilma and Angerer as two of the top possibilities. In the wake of Sean Lee‘s season-ending ACL injury, the Cowboys are weighing their options at the linebacker position, which includes eyeing some veteran free agents. According to Ed Werder of ESPN.com (via Twitter), Dallas is evaluating Brian Urlacher and Jonathan Vilma, among others. Regarding Urlacher, Werder adds (via Twitter) that nothing is imminent, but that the former Bear “took notice” when Lee went down and a hole opened up in the Cowboys’ starting lineup. Urlacher and Vilma are a couple of the more notable names available on a free agent market that also includes linebackers like Pat Angerer and Dan Connor. Still, even if the Cowboys decide to add one of those free agents, that player wouldn’t be relied upon to fill Lee’s role himself — Werder notes that the club figures to use a two-man platoon. It’s also possible that the Cowboys will simply elect to roll with their in-house options. Although the team has watched tape and evaluated guys like Urlacher and Vilma, a Dallas source tells Werder that the Cowboys don’t have a ton of interest in either player (Twitter link). We’ll have to wait and see if that’s a smokescreen or an indication that the club will pass on veteran free agents. Joe Philbin and Dennis Allen are among several coaches who have a lot riding on the 2014 season, writes Lorenzo Reyes of USA Today. While the “hot seat” label may be premature, the Dolphins would surely like to see improvement both off-the-field (in the wake of the Jonathan Martin scandal) and on it, with quarterback Ryan Tannehill potentially taking another step forward. The Raiders, meanwhile, used their ample cap space to infuse their roster with veterans, and the team’s leadership obviously hopes Allen can improve upon 2013’s 4-12 record. Free agent linebacker Jonathan Vilma reached out to the Dolphins, but Miami was not interested in adding the veteran, reports Barry Jackson of the Miami Herald. Vilma played only 12 snaps in 2013 following a knee injury. Patriots tight end Rob Gronkowski is reportedly “progressing well” following his January surgery to repair his torn ACL and MCL, according to Ben Volin of the Boston Herald. While Jerry Hughes won’t have a problem finding a role in new Bills defensive coordinator Jim Schwartz’s scheme, fellow pass-rusher Manny Lawson might, writes ESPN.com’s Mike Rodak. Lawson spent most of last season close to the line of scrimmage as a stand-up linebacker, and that position simply doesn’t exist in Schwartz’s defense. The Broncos’ defensive line is heavy on both depth and competition, writes Jeff Legwold of ESPN.com, and improved line play will be essential if Denver hopes to create opportunities for edge rushers Von Miller and DeMarcus Ware. Brandon Marshall is not worried about this future with the Bears, and he said as much on “The Waddle and Silvy Show” on ESPN Chicago 1000 (via ESPNChicago.com). “One way or another, they’re going to get the deal done,” Marshall said. The 49ers have been seeking a veteran inside linebacker and Brandon Spikes was one of the players on their list, says ESPN.com’s Bill Williamson (via Twitter). The player ultimately proved to be too expensive and signed with the Bills. In a separate article, Williamson gives a list of potential veteran linebackers that the 49ers could be interested in. Among them are Desmond Bishop, Dan Connor and Jonathan Vilma. Prior to signing with the Saints, Ramon Humber considered signing with the Vikings and the Patriots, according to Ramon Antonio Vargas of the New Orleans Advocate.